In Jammu & Kashmir, a ceasefire violation by Pakistan has been reported in north Kashmir's frontier Kupwara district. However, there has been no immediate report of any fatal or non fatal casualties or any kind of property damage on this side till now. Security sources said Pakistani troops resorted to unprovoked firing from across the Line of Control (LoC) in Karnah sector in the frontier district. 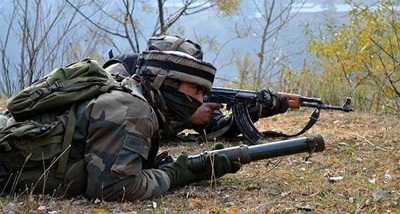 They said Pakistani troops resorted to firing with automatic weapons, targeting forward posts and villages on this side of the LoC at Sadhpora,Amrohi, Hajitra in the sector. Indian troops also retaliated in a befitting manner. The exchange of fire was still going on when the reports last came in. More details are awaited.